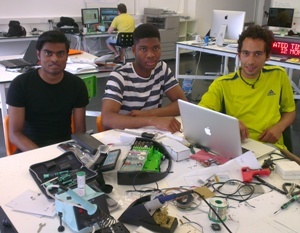 Four Middlesex University Product Design students have won a £5,000 grant to develop their healthy eating idea, as part of the Jisc Summer of Student Innovation competition. Their online web and app-based service, called 'Host&Dine', is designed to help students meet, cook, share and eat meals together. The team of students are among 20 winners of this year's competition, each of who will be given the grant to help them develop digital technologies designed to improve the student experience. They'll also attend a series of summer schools to help them develop their project management and entrepreneurial skills, while giving them the opportunity to learn from digital experts. The team of designers are currently enjoying internships at redLoop, the Middlesex University Design and Innovation Centre, where they have honed their skills in a professional practice ahead of the final year of their degree. Jonathan Joanes (21), Emmanuel Adeusi (21), Dan Giraldo (26) and Sonia Ginestar-Gomez (21) designed Host&Dine as they believed communal cooking in halls of residence offers students a great way to meet new people, discover international cuisines, learn how to cook and improve their diet. "The opportunity to enter the competition came along so I asked them if they'd like to work on it alongside what they're doing at redLoop, and they've put together a really, really strong entry," explained Andy Bardill, Director of redLoop. "We all just sat down and brainstormed for a couple of days," said Jonathan. "We were just targeting different areas of university and student life, so we harnessed key areas like money and health, and that was how Host&Dine was born." Daniel, who has lived in London for six years but is originally from Bogota, Columbia, added: "It was quite a surprise to actually win. We knew that we had put together quite a good proposal, but we weren't expecting to win so it was quite mad really." The team's ambition is to see Host&Dine developed into a fully-functioning app and website that they can take to market. "Of course, the dream would be that many students in the UK and around the world end up getting together to share and cook for each other using our app, but first we have to see if it is possible to develop it," Dan said. With their feet firmly on the ground, they are now looking forward to the summer workshops around the UK, which they hope will help them decide how to invest the £5,000 grant they have received. And if they do develop the idea and secure the necessary investment to realise its potential, they hope that it will enable students to share their cooking and eating in a similar manner to the way Airbnb allows people to find spare rooms to stay in around the world. To learn more about Host&Dine and watch the team's video pitch, visit the Jisc website.